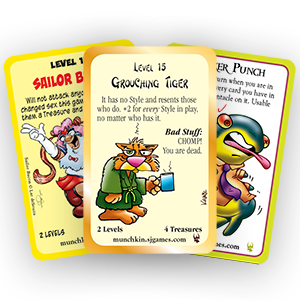 Cards like Grouching Tiger, Sucker Punch, and Sailor Bacon are eagerly awaiting an appearance in your next game. We have new promos for Munchkin, Super Munchkin, Star Munchkin, or any other variety you can think of. Plus, they're only 50 cents! What a steal. Even better, for every purchase made on Warehouse 23, we include free promos. We're literally giving them away! So next time you're on Warehouse 23, fill your cart with new Munchkin promos to add to your collection. But remember, this is just between you and me, got it?